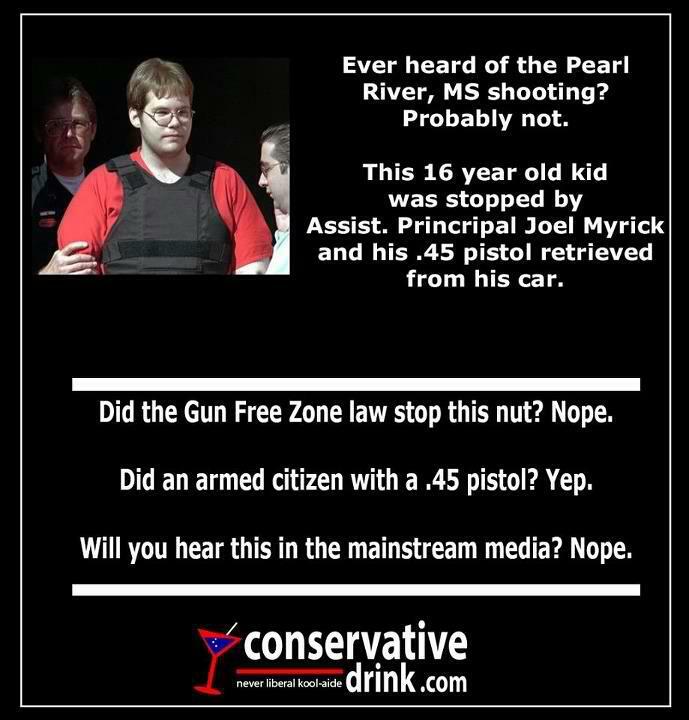 Ever heard of the Pearl River, MS Shooting? This 16 year old kid was stopped by Assistant Principal Joel Myrick and his .45 Colt 1911 pistol, retrieved from his car. Did the Gun Free Zone law stop this nut? Nope. Will you hear this in the mainstream media? Nope. It was Pearl, MS; not Pearl River, MS. And we did hear this in mainstream media back in 1997 when it happened. Actually, he did kill his mother and then shoot and kill students and was fleeing when the assistant principle stopped him. The reason we haven't heard as much about him is that it was longer ago (1997--two years before Columbine) and the number of casualties was relatively lower. There are lots of school shootings we don't really hear much about. What kept the body count low was not the armed assistant principal. What may have kept the body count lower was that his targets were more specific, or the type of weapon he had. So it is possible that gun laws that restricted, from 1993-2001, the type of weapon Adam Lanza used, did make a difference in this case. Also worth noting that the assistant principal didn't need an assault rifle to stop him--he stopped him with a simple pistol. As I read it, this example is another good example of how specific types of gun legislation can be very helpful. Most people calling for gun reform are not talking about taking away that assistant principal's handgun--they're talking about taking away the assault rifles used in so many of these senseless killings that allow people to shoot multiple people very quickly. It only takes one bullet to stop the shooter, so a ban on assault rifles won't harm our ability to take action against shooters like this. The problem is that an assault was never used in this latest shooting. It was with two handgun, the assault weapon was in the trunk and never touched, however a (banned at the time)assault weapon was used in the Columbine shooting. So please tell what law is going to stop a criminal? He was actually targeting more students when the gun toting Asst Principal ordered him to the ground stopping the attack. He used a hunting rifle, not an assault rifle. Does anyone know how much time he got in prison? There is no difference between an "assault rifle" *rolling eyes* and a semi-automatic handgun except as far as how fast they shoot. They automatically reload and eject casings and are ready to fire again at the same speed. This “assault rifle” officially is known as a semi-automatic rifle. A fully automatic weapon is one that requires a special permit and generally is restricted to law enforcement. An average citizen would find it hard to purchase a machine gun, in other words. There is absolutely no reason to ban the semi-automatic rifle and leave the semi-automatic handgun in the hands of citizens if the purpose is to slow down the bad guys. If our purpose is to completely STOP the bad guys so that the "body count" is ZERO (not "low"), it seems that armed guards at the doors of our schools might be a good idea, as well as getting the mentally insane committed BEFORE they hurt people, not after. It would also create jobs because you would have to employ the guards and the staff for more mental hospitals! Killing two bird with one stone might be a bad analogy. Everyone I hear screaming says to take away ALL guns... what a joke. Everyone wants the killing to end. So much of it would never have happened if the gun owners had secured their firearms. I personally agree with background checks for all firearm transfers. But I don't want gun registration where someday soldiers knock on my door to collect all my weapons and they have a inventory list to go by. Don't laugh. It's happened before. In the aftermath of Hurricane Katrina law abiding citizens were disarmed by guardsmen going house to house collecting weapons. I have a right to defend myself from criminals and tyrannical government (God forbid). I have a right to use weapons for defense and for survival. Lock up the guns - and that can cure a majority of the problem. He is currently serving three life terms plus an additional 140 years in prison. He will be eligible for parole in 2046, when he is 65 years old. Is this a completely accurate accounting of the incident? Nope. It omits certain details and leads to faulty assumptions. For instance, it's true, the principal got a weapon from his car and "stopped" the shooter. They were in the parking lot and he stopped the sixteen year old from getting into his car and leaving the scene. Unfortunately, nothing stopped the carnage that took place in the shooter's home and inside the school earlier that day which left three people dead and seven more wounded. Correction Mr Myrick stopped Luke in the parking lot not in the school. You need to update your knowledge with updated information. That was the orginal report, which turned out to be false. All of the victims were killed with a .223 caliber round, and the gunman killed himself with the handgun. Don't be lulled into a false sense of security when the government says, "It's 'only' assault rifles...you can keep your handguns". The truth of the matter is that the balance of power will be shifted when you will no longer be able to defend yourself against those who will have assault rifles (i.e. the government itself), your handgun will not be sufficient. Also, this whole "gun control" idea is a slippery slope, once started there is no telling where it will stop. We've all heard the saying, "Guns don't kill people, people kill people," and the truth of the matter is that we have allowed our society to degrade life in issues from the womb to TV, movies, video games and music. When will the people say, "The Entertainment Industry needs to be reformed?" If you chart our sociological demise you can trace it back to the decade of banning prayer in school and dismissing the Ten Commandments...when we turn our back on God we loose our way in life and now we have 50 years of seeds sown...no wonder we are reaping destruction. Assault rifles are legal. they just cost a small fortune and are really hard to obtain. You must have permission from your local sheriff plus all the normal background check stuff. At least in the state of Indiana. However looks like that luxury won't last long. The only thing that prevents muders of innocents , especially mass muders ,are weapons in the hands of good people at the point of contact. There are many countries in the world which are renoun for peaceful governance, low crime rates, diplomacy and sustainability. None of them concern themselves overtly with guns or religion. If you want to talk about sociallogical demise, please first educate yourself empirically about sociology. No. Hitler and the Third Reich targeted a group of people. Not weapons. I'm 60 years old. 40 years ago the government was all about trying to take away our hand guns. Rifles were not the problem it was the hand guns. They weren't successful with that, so now they are going for the rifles. It doesn't matter what type of fire arm they take away. If we give them the ability to take anything- they will soon take them all. A defenseless public is the breeding ground for TYRANY! Everything that you wrote seems spot on to me. I am 59 and I remember the craze over banning handguns. It is against the rules for a 8 year old to point his fingers and say "bang", but perfectly fine to force-feed him violence through movies, TV, games, etc. The world is upside down. I would like to know myself what an assault rifle is. In the 1700's it was any gun that had a rifled barrel. Is that still what an assault rifle is? If so, that was the gun that started the revolutionary war, when the british tried to ban assault rifles. There reason was to have better control of the States. It may be any type of weapon that our government feels we shouldn't have, that becomes an assault rifle. The common law gives us the right to own guns "including military weapons" for purposes to defend ourselves against tyranny. The Second Amendment was put it place to take away that right. Although throughout history the right has been taken away by our own government little by little.